What are the advantages of shopping for cement at Materialtree.com? Buying cement on-line is now an hassle free method. 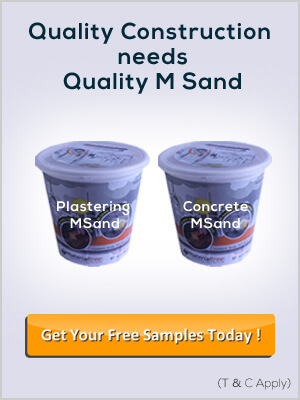 At materialtree.com you do not need to go in search of seller outlets for the procurement of quality cement. All you need to do is, choose the cement grade from the variety of brands available at our materialtree.com web site and place an order. Fresh stock from the manufacturer, with correct load will be delivered to your project site within the promised time, ultimately saving your time and cash. Multiple cement brands of prime quality cement are available at materialtree.com, that complies with trade standards, all available below one roof, thus making it easy for the shopper to opt for from range of cement brands at the best market value. What are the Grades of Cement available & how is it useful? The grade indicates the compression strength (mpa) of the concrete that will attain after twenty eight days of setting. There are about five types/grades of cement available at materilatree.com i.e., 43 Grade, 53 Grade, PPC, PSC, Concrete Cement, White Cement. 43 Grade: 43 Grade cement attains compression strength of forty three mpa (mega pascals) in twenty eight days of setting time. forty three Grade OPC Cement are usually used for coating works, Non-RCC structures, pathways etc wherever initial setting time isn't of importance. 53 Grade: 53 Grade cement are used for fast paced construction were initial strength is to be achieved quickly. fifty three Grade cement has fast setting compared to forty three grade cement. 53 Grade attains twenty seven mpa in 7days compared to twenty three mpa by 43 grade cement. 53 Grade OPC cement is employed in RCC and pre-stressed concrete of higher grades, cement grouts, instant plugging mortars etc. wherever initial higher strength is that the criteria. PPC:Portland Pozzolona Cement or PPC is manufactured by blending a mixture of ordinary portland cement and Pozzolana material like fly ash about 15 - 30 minutes by weight of cement. The fineness of PPC will be larger than OPC. PPC is employed in the mass concreting, Marine structures, also under adverse condition conditions. PSC:Portland slag Cement or PSC is manufactured by combining blast furnace slag, cement clinker and gypsum. The initial gain of strength is somewhat lesser in comparison to OPC, but it attains a lot of strength than OPC at the end of twelve months. PSC is used in mass construction wherever lower heat of hydration is advantageous or in marine situations and structures near coastal region or usually for any structure where additional sturdiness is desired. Which are the cement brands available at Materialtree.com? All major brands of cement like Zuari, ACC, Ultratech, Birla, Coromandel, Chettinad, Dalmia, Jaypee, JSW, Nagarjuna, Bharathi, Penna, KCP, Ramco and many more are available at materilatree.com at the best prices in bangalore. What is price of cement in Bangalore?